Gaia: Hey, look! It's the RECALL portal! It allows you to send Dragons back to Dragonverse so they can start a new life there. If you have more than one Dragon of the same type, you can Recall them. Bear in mind that they will not return. Deus: The Dragons you Recall will reward you with their orbs as a farewell gift! 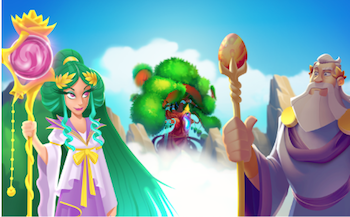 Gaia: Remember that with enough orbs, you will be able to Empower the Dragons that you keep in Dragon City! What does it mean to RECALL a Dragon? Recalling a Dragon sends the Dragon back to Dragonverse, where they will live in an amazing Dragon dimension! As they leave Dragon City, their essence remains in Orbs that they leave behind. How do I Recall a Dragon? You can recall Dragons through the Tree of Life. You can also Recall Dragons that are in your Dragonarium, directly in the TOL! Search for your duplicate Dragons in the Recall Screen by using the filters. NOTE: When searching for duplicates, this will list all of your Dragons for that type, please be careful to which Dragon you recall, by looking at the Dragon Level, you may not want to recall the strongest Dragon! How many Orbs will I get after recalling a Dragon? This depends on the Dragon Level and Power Stars. (Note: Power Stars are related to the Empower feature, which is covered in depth in a different FAQ). Remember that you can use Dragon Orbs to Empower Dragons, and every time you do so the Dragon gets one Power Star. Example: You can see from below that you would get 60 orbs for the Macha Dragon. Will I ever get the Recalled Dragon back? Dragons sent to the Dragonverse cannot return to Dragon City. But you can always Summon a Dragon of the same type if you have enough Orbs. Please note: If you sell or have sold your dragons, we will not be able to reverse this, even if it was accidental. How many dragons can I recall at the same time? Only ONE Dragon may be recalled at a time. Which dragons can I recall? You can recall any Dragon type, but please note that you can only do so if you have more than one Dragon of the same type, that is, you can only Recall duplicate Dragons. When can I recall my Dragons? You can recall a Dragon at any time unless the Dragon is busy Breeding, on a Mission, in the Training Center, etc. Dragons in the Dragonarium can be recalled without needing to place them in an habitat first. Dragon eggs that you have in the storage cannot be recalled without hatching first. Should I recall my duplicate Dragon, or sell it? At which level does the recall function unlock? Why do I not have this feature yet? Where do my recalled Dragon Orbs go? You will find your Orbs in the Tree of Life, both on the Summon screen and on the Empower screen. You'll see on both a list of Dragons you currently have orbs of, and you will see how many more Orbs you need to Summon/Empower that particular Dragon respectively. 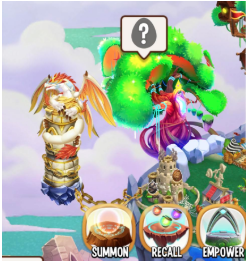 You will not see the dragon listed on the Empower screen if they are not placed in a Habitat! What happens to my Dragon Master points when recalling a Dragon? You will lose the DMP associated with the Dragon you just recalled. But don't fear! You can use the orbs you got by recalling, to Empower a Dragon of the same type, and gain much more DMP as a result! That's all for now. Go back to your game now and start discover the full potencial of the Tree of Life!